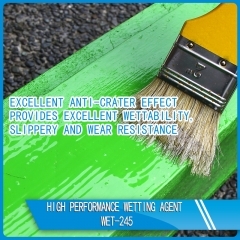 Description Polyether modified polysiloxane spray adjuvant WET-628 is a high permeability surfactant/wetting agent based on a polysiloxane. It lowers the surface tension of spray solutions, beyond that which is achievable with conventional adjuvants. 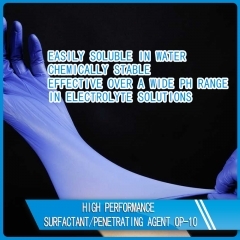 Type Polyether modified polysiloxane Key features Nonionic Medium spreading High permeability Promotes spray volume reduction Promotes rapid uptake of agrochemicals (rainfastness) Superspreader for soluble liquid and emulsifiable concentrate formulations Typical properties Appearance: Colorless clear liquid Active content (%): 100% Density (g/cm3): 1.01 Viscosity (cp, 25 ℃): 100-130 Cloud Point (0.1 wt%), (℃): 49 CAS: No. 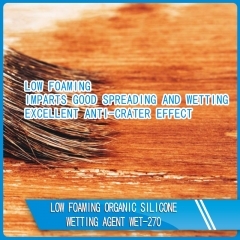 27306-78-1 Surface tension (0.1%, dyn/cm): <22.5 Application -Plant Growth Regulators 0.025% to 0.05% -Herbicide 0.025% to 0.15% -Insecticide 0.025% to 0.1% -Fungicide 0.015% to 0.05% -Fertilizers and Micronutrients 0.015% to 0.1% Note: use rates are dependent on crop, agrochemical and spray volume requirements. 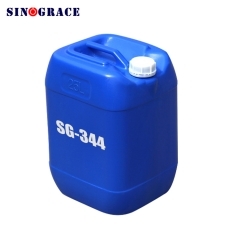 Storage and handling Available in 25 kg/barrel or 200kg/barrel Store products in tightly closed original containers at 5-40℃ Shelf life: 12 months from delivery date According to non-dangerous goods transport How to use IN AGROCHEMICAL FORMULATIONS -WET-628 may be used as a component in agrochemical formulations. 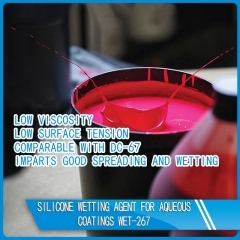 Although organosilicone surfactants are subject to hydrolysis under acidic or basic conditions, optimum performance is achieved by buffering the formulation to pH 6.5-7.5. 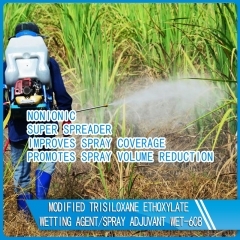 Additionally, it is recommended that WET-628 spray adjuvant be used at a concentration of at least 5%,based on the total formulation. 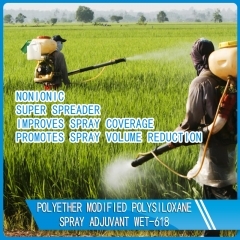 A TANK MIX ADJUVANT -WET-628 spray adjuvant, when used as a tank-side adjuvant may be used to improve spray coverage, improve uptake or to allow for a reduction in spray volume. WET-628 spray adjuvant is most effective as a tank-side adjuvant when spray mixtures are 1) within a pH range of 5-8, and 2) used within 24 hours of preparation. 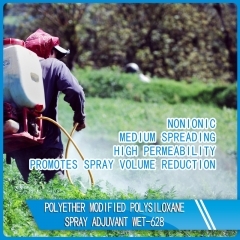 -High spray volumes, coupled with high surfactant rates, are not required to achieve sufficient coverage with WET-628 spray adjuvant. In fact, it has the potential to provide adequate coverage in many low volume spray applications at rates between 0.025% and 0.1%.